PlayerUnknown’s Battlegrounds (PUBG) has swept the gaming world like a tidal wave, sailing to Steam’s most purchased game of all time, while currently extending over 13 million copies sold as console gamers watch from the sidelines. Green as far as the eyes can see. Erangel is fully-loaded with cities, structures, buildings, underground shafts, and sights to see, with precious loot hiding in every corner of the map. The name of the game is to loot, shoot, survive, and dominate. The setting can be distracting and beautiful, though. With the salty sea breeze floating in from the west and the trees blowing gently in the wind, you take a moment to admire your new weapon and level two armor and you look out over the rolling green hills, taking note of buildings in the distance. Suddenly, a gunshot rings out, and the bullet responsible for the sound is coming from 900 meters away right at you, the soldier who stopped to sniff the flowers. PUBG is one of the most intense gaming experiences out there, leaving players with sweaty palms, racing hearts, and surges of adrenaline that often result in a grunt or victory scream. I’ve felt the thrill of horror games, war games, and fast-paced competitive gaming, but none of these experiences compare to crawling around on your bare belly across a hay field surrounded by enemy snipers — who are already engaged in a shootout with each other — equipped with nothing but a backpack and frying pan. The game remains fresh every round, thanks to the “blue circle” mechanic (inspired by games like H1Z1), which gradually closes down on a different final area each game, forcing players to fight for that location. But running around Erangel since March has grown stale. I’m far too familiar with the area, and the sense of wonder that hit me when the map was unfamiliar simply isn’t there anymore. 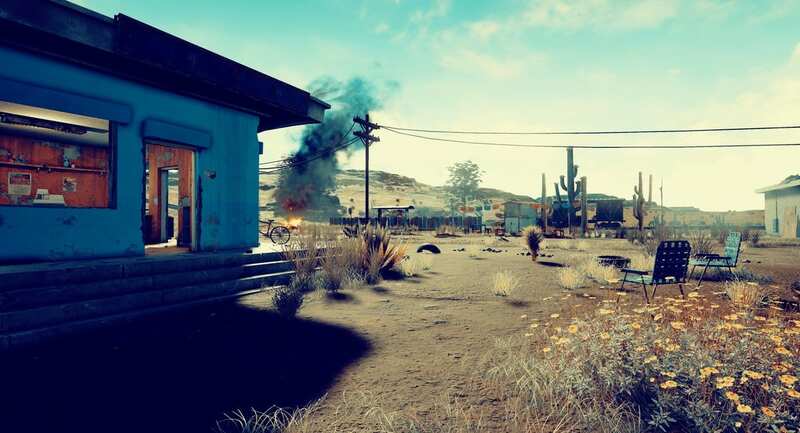 Thankfully, the folks at Bluehole are one step ahead, and for months have been developing a Desert map, and with each passing day, the PUBG community gets one step closer to this game-changing experience. 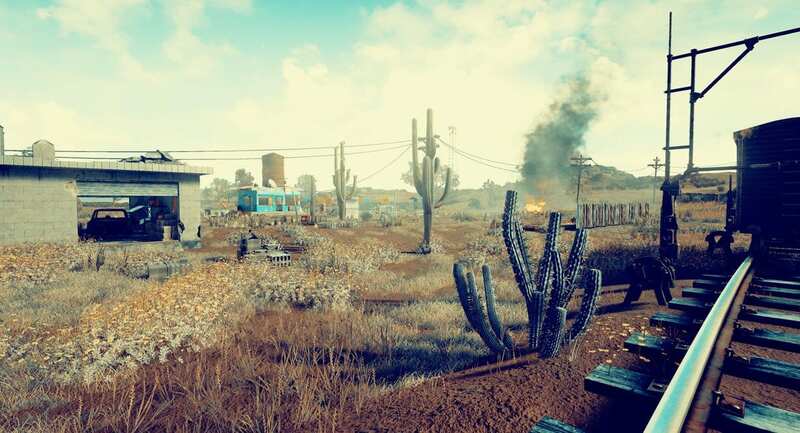 Early on November 13, Reddit user /u/bizzfarts posted the following image of the upcoming PUBG desert-themed map (source). From this snapshot alone, it’s clear that plenty of time, effort, and attention to community feedback has gone into the creation of this new map. Without the strong surge in population and devoted community, perhaps we would never see another map for PUBG. The Desert looks more congested than Erangel. The layout of buildings indicate this, as there are both more buildings and more clusters of buildings closer together than there were in Erangel. This could lead to some interesting city shoot outs and ambushes. High rocky cliffs to the west will act as a natural border for the game’s playable area, which will probably wrap around the northern part of the map, as well. The large body of water is intriguing, possibly offering players an alternate route from the opposite sides of the map. It feels like uncharted territory, and I can’t wait to see what places like “Rage” have in store for me. These images were shared by PlayerUnknown himself, via Twitter. Early on, there were rumors that the map would be 4km by 4km, (a fraction of Erangel, which is 8km by 8km,) but this was clearly scrapped. 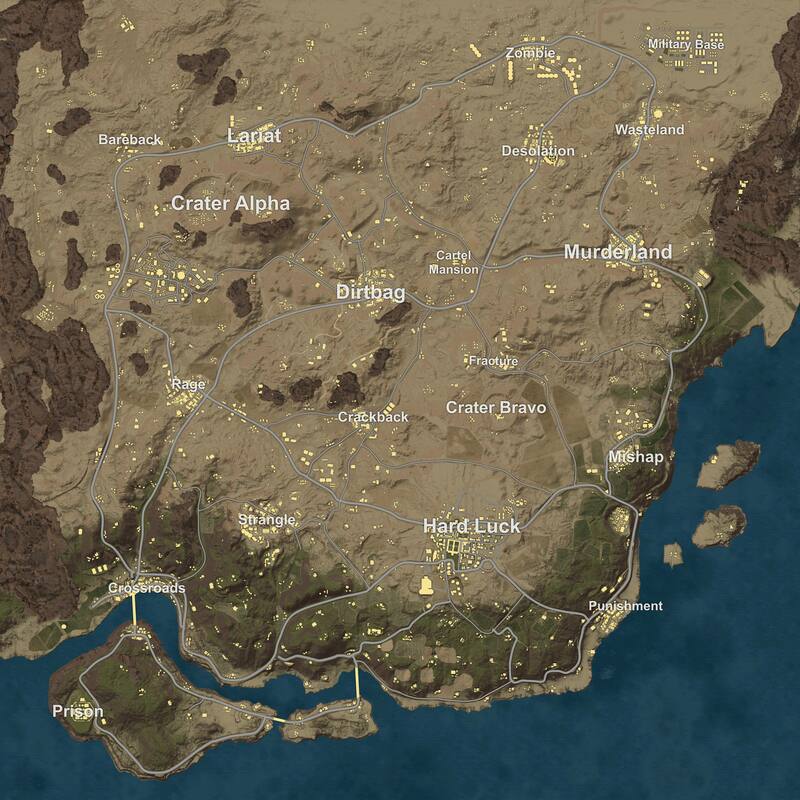 The map is 8×8, and from what I’ve seen of it thus far (mostly from PlayerUnknown’s personal Twitter page), it looks as desolate, open, frightening, and gritty as its predecessor. The desert will be a fantastic addition to the game, allowing for more variety while spicing up the game with new buildings, locations, vehicles, and sights to adjust to, in hopes of eventually mastering and dominating the new battleground. This vaulting system has been hinted at for months, and in theory would greatly increase player maneuverability within the game. But, supposedly, the process involved a ton of work to get right. Thankfully, they’ve taken their time and have figured it out. Vaulting and climbing is now featured and playable in the PUBG PTR server. Maintenance to ballistics is just another healthy patch to the game’s consistent efforts to keep gameplay fun and fair. The wait for vaulting is over, but there’s more on the horizon for PUBG. Xbox gamers can finally play the game, because on December 12, PUBG is coming to Xbox One. This isn’t to say that PUBG has suffered a decrease in population. The sales records for the game climb higher each day, and the upcoming console release will do nothing but bring that number higher. The addition of vaulting and climbing, as well as the upcoming Desert map, is already enough to re-spark my interest in PUBG and pull me away from Destiny 2 for a couple of days.